WHILE working on an exhibition on the arts of the Punjab these past few weeks, I became sharply aware of the extent to which, from earlier times, it is the arts centred upon the courts that keep impinging our awareness, claiming all our attention. One almost forgets that, beyond the glitter of appearances, the sheen of courtly objects  which the retained court artist naturally concerned himself with  there were other things, other lives. Of these, a very inadequate record seems to have been kept; in any case, very little of it has survived. One might, in the subsidiary figures that occupy little corners in some paintings, or in the few available sketches of the artists themselves and men from their immediate circle, catch an occasional glimpse, recognise a reflection. But, in general, the lives of ordinary men and women remain obscured from our view; one does not even see many ordinary, everyday faces. This began to change somewhat, however, as the nineteenth century moved on. There were new factors at work: The break-up of the monolithic central authority that the Sikh kingdom of Ranjit Singh represented; the thinning down in the ranks of aristocracy; the different interests that the British, with their vastly extended domains and area of influence, wished to pursue; the rise of Company painting in response to changed needs; an awareness of different techniques, new media; the arrival of photography, mechanical means of recording appearances, in other words. Whatever it was that operated in different situations  these factors working singly or jointly - one senses a certain opening up on the part of the artist, a desire to move into new grooves. Some visually exciting work appeared at this point, done at a distance from the court, addressing other than courtly themes. One speaks here not of what has come to be designated as bazaar work, but of work done at another level: more serious, more aware of quality. Much of this work either takes a thin strand that was already present in earlier, more classical or courtly work, and builds upon it, creating in the process almost a new genre; or it emerges out of the popular work that many an artist  less skilled, or in unseemly haste  was doing, but stands apart from it on account of the conviction with which it is done. To the first category belong some of the portraits of ordinary men that one sees from a centre like Patiala. Sud-denly, piles of sketches  brush drawings, lightly tinted sometimes, or partially painted  come into view: Portraits of shopkeepers, moneylenders, peons, lowly functionaries at the court, and the like. Small in size, and done on loose sheets, and therefore looking inconsequential, these are done with a sensitivity that takes one by surprise. One knows that many of the painters at Patiala, working in a style inspired by Jaipur-Alwar work, had always observed well. But the sketches that one sees, roughly from 1875 onwards, breathe a different air. There is freshness in them, and an honest feeling of warmth. Whether these were made in response to the challenge that photography posed, or were inspired by it, is not a matter of consequence: their quality is. Some of them are riveting. In making these, the painter creates not only a gallery of men whom one does not ordinarily see in high art: he seems somehow to recover a bond with the earth that the common man always had, but art had lost. To the other category belongs the work of a painter like Kehar Singh. One knows of other Punjab painters who are mentioned in the same breath as him, and were active around the same time: Kapur Singh among them. But Kehar Singhs work, influenced as it also was by European watercolours and oils, and by photography, stands apart from theirs. Asked to produce pictures of men plying different trades and professions, or belonging to diverse ethnic groups that made up the Punjab of those times, he went about his task in a distinctive manner. Instead of producing generalised pictures, he took specific individuals  whom he named in the notes he inscribed on his sheets  and portrayed them with the same earnestness, the same degree of involvement, which he might have brought to a portrait of a sovereign, or a man of rank. The work is honest, and immediate. Some of the men and women he portrayed belonged to peripheral groups  wanderers and trackers, persons who were categorised as being from criminal tribes  but even as one sees their likenesses, as he recorded them, one can smell the earth, feel the texture of the dust under ones feet. There is a series of painted sketches by Kehar Singh, done around 1875, in the Chandigarh Museum, and from it I am inclined to pick just one up to describe. It is a painting of a twosome, the man, named Ruldu, a tracker, khoji by profession; and the woman, Dharmo, a member of the Bawaria tribe. It is a remarkable study. The two can be seen at sight to belong to the one of the Vagrant, Menial and Artisan Castes, as listed in the census of 1881. In that survey, the Bawarias were described as "a hunting tribe who take their name from the bawar or noose with which they snare wild animals". No good words are used for them: they are much addicted to crime; "thieving" comes easily to them, the note says. But it is also added that "their skill in tracking is notorious". What Kehar Singh renders here, then, is possibly a couple, both engaged in the softfooted business of tracking criminals and animals. Ruldu, the khoji, though now old, stands here, ramrod straight, holding a tall spear with a lethal-looking blade. There is remarkable alacrity about his person. Dressed only in a short loin-cloth dhoti, and with a chaddar draped over his shoulder, he seems ready to spring into action, all his belongings gathered in the cloth bundle slung over the shoulder. 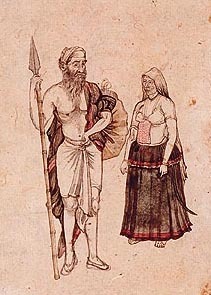 Dharmo, of the Bawaria group, also in the profession of tracking, stands close by, dressed in a flouncy but coarse ghaghra-skirt, a short, low choli with an apron-piece, the petia, suspended from it to cover the stomach. Although well-worn with years, she too looks singularly energetic, the sword attached to her belt, and hanging at the side, adding to the impression. The faces are sharply studied, reflecting age, anxiety; professional self-assurance, all at the same time. Seeing the work you feel, suddenly, very very close to the earth.